This is my dad’s favorite. Since I have taken over the cooking, I have never attempted to make it. I always thought it was complicated and was daunted to even try it. But for Father’s day, I threw caution to the wind and tried my hand at it. It’s actually really really simple. 1 x rectangular Pyrex dish. 4 x drum sticks and 4 x breast portions of chicken. 1 x 420g Koo Baked beans in tomato sauce. turmeric powder, enough to sprinkle over all the chicken pieces. masala powder, enough to sprinkle over all the chicken pieces. 2 x cups cake flour. Peel the potatoes and chop in quarters, boil till soft, drain, season with salt and add 1/4 cup milk. Mash until a creamy mash potatoes is formed. Rub the chicken pieces with salt, sprinkle the turmeric and masala over the chicken and then rub into the chicken. In a plate pour the cake flour and mix it with some salt and pepper. Heat oil in a pan over a medium heat, dip the rubbed down chicken pieces in the flour, ensuring that the entire chicken is covered in flour. Fry till golden brown all over. Remove from the oil and drain on hand towel. Slice the onions and fry till soft, remove from oil and also drain on hand towel. Lightly grease your Pyrex dish with some margarine. Layer the fried chicken on the bottom. Pour the bake beans over the chicken. Slice the tomatoes evenly and sprinkle with salt and pepper on each side, rub nicely in. Place the fried onions on top of the bake beans. Place your tomatoes over the onion. Sprinkle thyme generously over the top of the tomatoes. 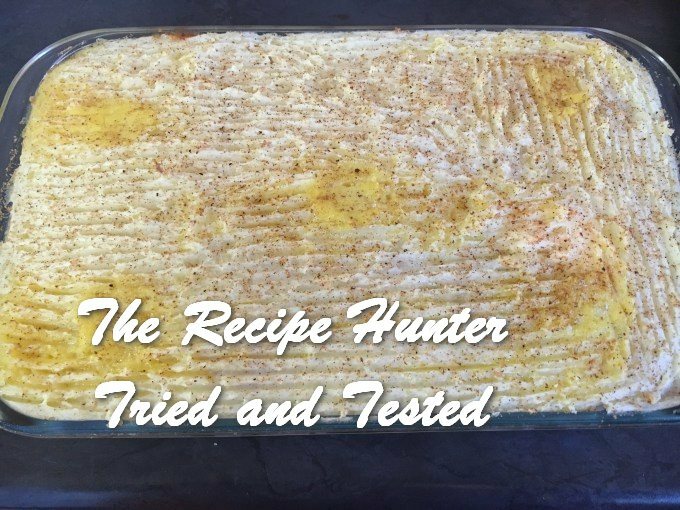 Spoon the mash potato over the top and evenly spread, then take a fork and gentle run it over the top. Grate the nutmeg over the top and place blobs of butter on top. Pop in a preheated oven at 180 degrees and bake for 10 – 15 minutes or until the mash potato is lightly golden.